(Nanowerk Spotlight) "You cannot have an appropriate social dialogue on nanotechnology without an open-minded, consistent and even audacious communication roadmap aiming to bring everyone in." So begins the foreword to a new Communication Roadmap by the European Commission on communicating nanotechnology in Europe. Very true! But coming from an organization that is not exactly known for a coherent and consistent, not to mention timely, approach to communicating across its many members, cultures and languages, it's going to be interesting to see what they have come up with now. If the Commission-funded Nanoforum website – which nobody seems to be using anymore and which slowly is sinking into obscurity – is any indication, then this exercise might mean just more dead trees to compile a slick 188-page report plus a 68-page annex. It certainly is off to a bad start when, even before you reach the contents page, clicking the link provided in the PDF version at "This publication can be downloaded free of charge from the Internet" does not work because someone has messed up the URL (that problem occurs not only once in the PDF...). It's also a bit disingenuous if in the preface, Christos Tokamanis (his title is "Head of Unit for Nano- and Converging Sciences and Technologies, Directorate G, Research Directorate-General of the European Commission") starts off by stating that "The European Commission has been very quick to understand just how hot nanotechnology communication is. This sharp awareness has been matched by the strong interest and real concern of EU institutions, and has steadily produced a growing range of socially engaged policy documents and dedicated projects over the past few years" – only to write just two paragraphs later that "Engaging a public that might have been inadequately informed so far, or perhaps outright misled because of the very complexity of the issue, is the core challenge. In these policy documents the EC observed that 'nanotechnology is poorly understood." So what he seems to be saying is that the EU has been churning out report after report for the past six years (it started with the "'Towards a European Strategy for Nanotechnology" in 2004) in which it continues to state that nanotechnology is poorly understood, and as a result the public "might have been inadequately informed so far"? Hmmm... wasn't the whole point of these reports to inform the public? That's a bit like BP saying that it knows that deepwater oil drilling is very risky and it requires a detailed and competent disaster contingency plan; something it has been pointing out in each and every one of its contingency plans for the past six years. But anyway, let's give them the benefit of the doubt and take a look at what they are planning to do in the coming years. 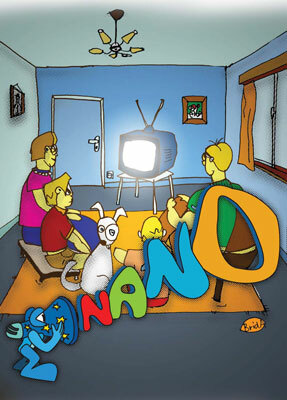 According to Tokamanis,the European Commission "takes this whole communication effort on nanotechnology so seriously, that it now wants to prepare for an appropriate dialogue among stakeholders about the social challenges of nanotechnology: this has been the focus of two further publications issued at the beginning of 2008 and of other projects launched during this and next year, with special emphasis on television and Web media, as well as on young people. Reaching the right audiences, with the appropriate message and means is of essence. All these dialogue efforts will culminate into the European Platform on Nano Outreach and Dialogue (NODE): it will deal with a specific system of mechanisms to enliven and coordinate the continuous and open dialogue on nanotechnology within the whole EU society, empowering both EC and Member States with a very challenging tool for delivering technical democracy on nanotechnology." The Simpsonesque cover art of the new EC report "Communicating Nanotechnology". This "whole communication effort on nanotechnology" is now documented in a new document, titled Communicating Nanotechnology – Why, to whom, saying what and how?. It presents the focus, objectives, methodology and actions to be developed in the near future. In Tokamanis' words: "The main prospective figures of communication outreach and dialogue are just as impressive: it is estimated that around one hundred million citizens will be reached over three years, between 2009 and 2011." The man clearly is impressed by his own plans. Although we started with low expectations, we were surprised to find that there is lots of good stuff in this proposed communications roadmap, authored by Matteo Bonazzi. Where are we now? This part, with not even 40 pages, is thankfully short for an organization that loves to spend millions on literature reviews. Where do we want to be? This section lays out the goals of the communication roadmap addressing the Ws of standard textbook strategy – why? who? with what effect? to whom? what? where and when? – supplemented with how? and how well? How do we get there? How will the roadmap be implemented? This section contains an exhaustive list of all current and planned European activities and initiatives to communicate aspects of nanotechnologies. The good news is: It's quite nice to see all these diverse activities finally listed in one place. It drives home the fact that there is a lot going on already in communicating the science, the actual developments, the prospects, but also the risks of nanotechnologies. Above all, it's encouraging to see someone making the efforts to tie it all together in a coherent strategy. The bad news is: this is the European Commission – notorious for its massive bureaucracy; slow; expensive; and being run by committee. The fact alone that they come up with a meaningful communications roadmap only many years and many billions of euros after embarking on a huge R&D effort speaks for itself (the situation in the U.S. isn't much better; on the contrary, they don't even have this kind of communications roadmap). In a corporate structure you would have the Head of Strategy or Corporate Communications Director or even the CEO sign off on this document and then being held responsible for it, so that there is at least a semblance of responsibility. In case of the EC, if this roadmap fails (which would require to have someone check in a few years time to assess how it has done) nobody will be blamed or even fired. A new group, or the same group, of bureaucrats will then spend a few million euros in taxpayer money to conduct surveys and workshops and seminars and just write a new one.